Vidyarambham or Ezhuthiniruthu is a Hindu tradition observed on Vijaya Dashami day in Kerala during the nine-day festival, Durga Navaratri Pooja. “Vidhya” means education and “aarambham” means beginning. That is why Vijayadesami is also known as Vidyarambham. Where Thousands of children in kerala entered the world of learning by scribbling their first letters on Vijayadasami day. 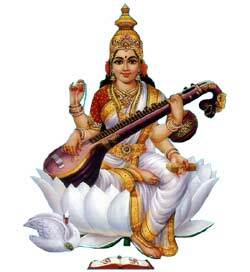 It is normally conducted in the morning in front of Saraswathy’s idol, where Saraswathy pooja is done. is used to perform writing. Through this mantra, a kid is writing the names of three deities Hari, Ganapathi and Saraswathy. Initially, the mantra is written on sand or in a tray of rice grains. Then, the master would write the mantra on the child’s tongue with gold.Writing on grains or on rice represents the progressive learning ability of the child. Writing on sand indicates the hard work and efficiency of the child. Writing the mantra on tongue represents the blessings of Goddess of learning, Goddess Saraswati. By the mercy and the blessings of Goddess Saraswati Devi provide us the wealth and prosperity, hence the letters or the mantras are written on tongue with gold. Most well-known Temples for Vidyarambham ceremony for children. Now days Vidyarambham conducted for children irrespective of religion across Kerala. Malayala manorama conducting Vidhyarambham in different centers in Kerala and outside Kerala.